At the Hans Merensky Hotel & Spa, guests will be assured of a unique African experience. The Hans Merensky Estate is set in the splendour of the Limpopo Province bushveld and offers the discerning traveller and sport enthusiast a unique African experience. The famous Kruger National Park, one of Africa's largest game reserves, stretches along the entire length of the Estate's eastern boundary. 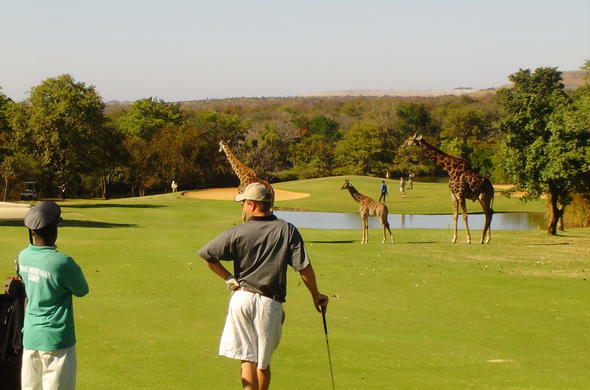 Greet the African dawn on the manicured fairways of the challenging 18 Hole, Par 72 Championship golf course, where Crocodile and Hippo add spice to the normal 'hazards' of a good game of golf. The main hotel itself with its large trees, water features and beautifully landscaped gardens, as well as the cool ambience of the traditional thatch, provides an oasis of leisure and elegance, the ultimate African dream.